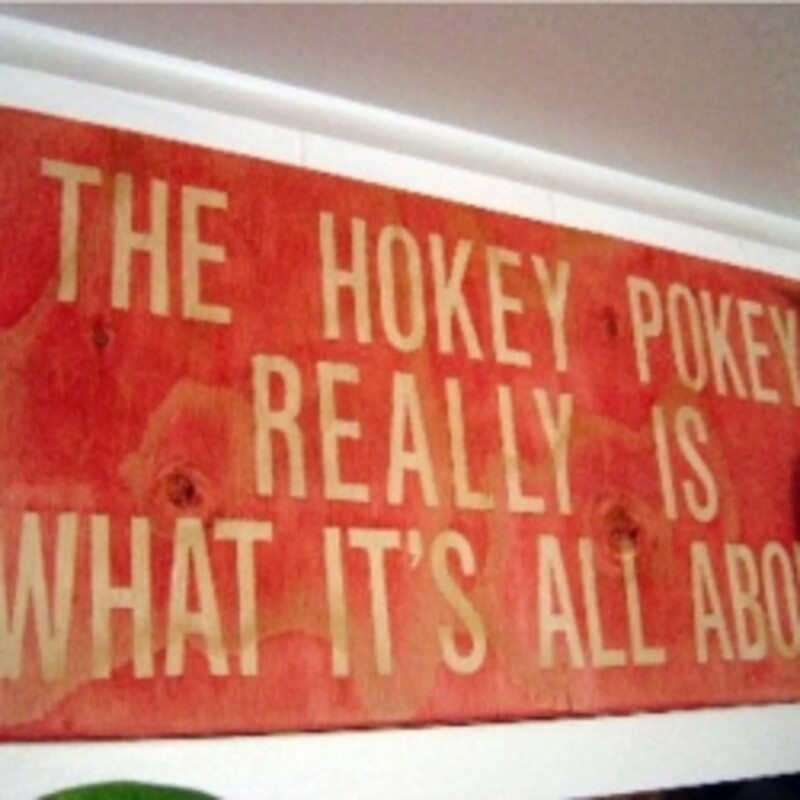 My Home is a hodgepodge, very eclectic if you will, when it comes to decorating. I never liked themes and years ago, I decided that I preferred the random choosing of things that I like, things that have a history of sorts to me or someone else, or things that are simply beautiful in their own right as a means of decorating the place where I live. I prefer to be surrounded by things that speak to me, remind me of an earlier time, or simply make me feel good. 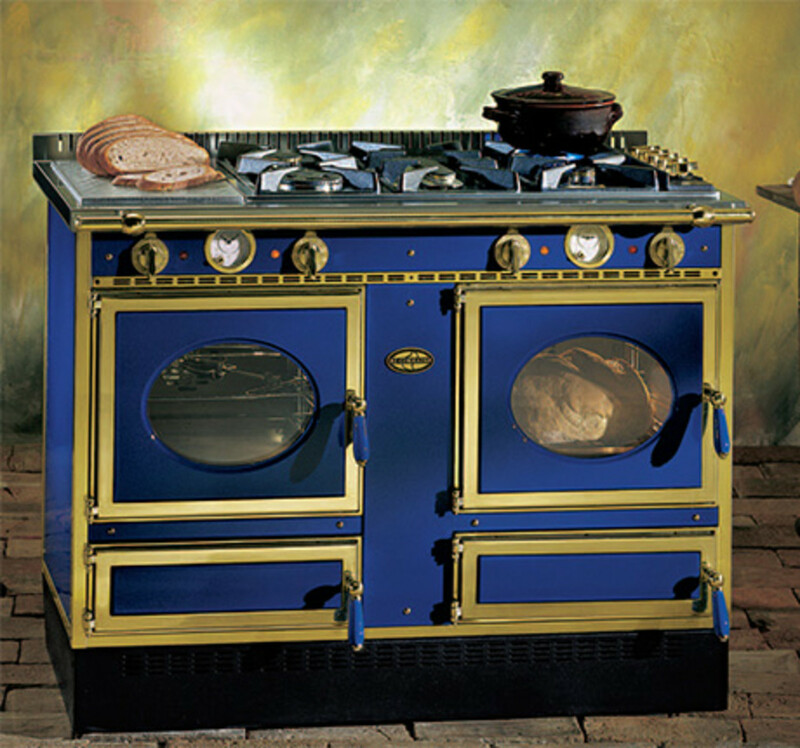 I have never been a matchie, matchie type, the kind of person who feels as if every fabric, every wood color or tone, even every picture has to match or at least be part of a grand design, a bigger plan. No, to the contrary, I long ago realized that those means of decorating left me feeling sterile as if I were in a doctors waiting room and for me, that look exudes pretty much anything except warmth, hominess and comfort. If I had to describe my taste in a word again I guess the best would be "Eclectic" a myriad of styles, colors, wood types, leathers, old and new, books, pottery, drawings, paintings, etc. and lots of it. 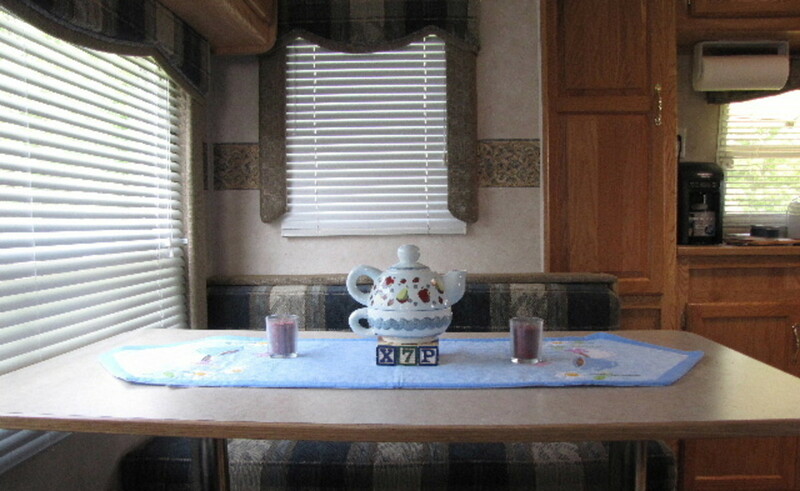 I prefer the comfortable style of a "New England" Bed and Breakfast with Windsor chairs, and blue dishes possibly mismatched, leather foot rests, and quilts made from scraps that were gathered up and saved over time. My taste being what it is, I guess I am naturally drawn to the new and growing trend of re-purposing, taking old items and with a little effort, sometimes more than others making them new again and putting in a place of use and prominence in the home. I don't know exactly when this idea started or how it took hold but it is literally sweeping the country and with good reason. It makes sense. For far too long, we as a nation, especially since the 1950s and 60's , have taken the misguided position that if an item was broken it should be thrown away and a new and better one bought to replace it. For years we did that as a society until one day we started to hear news of swelling landfills in big cities like New York and Chicago and trash barges afloat in the ocean with nowhere to empty and at some point someone really smart said "hey this has to stop" and the Re-fresh, Re-use, Re-cycle Movement was born! Don't think of what it was meant to be. Think of what it can be! 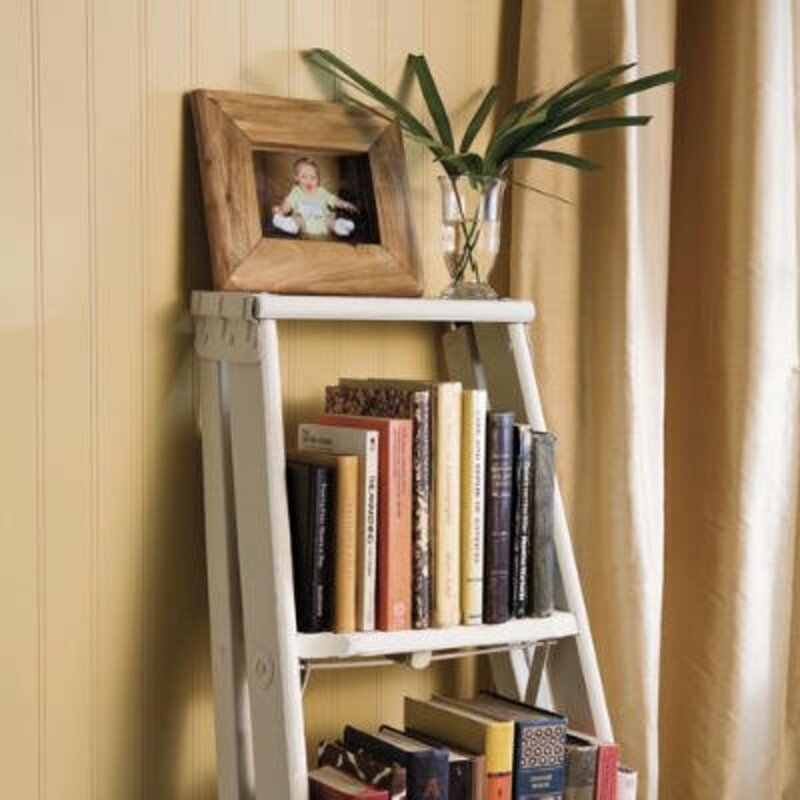 An old stepladder (you may have one lying around in your garage or basement) can be easily converted into a great little bookcase! 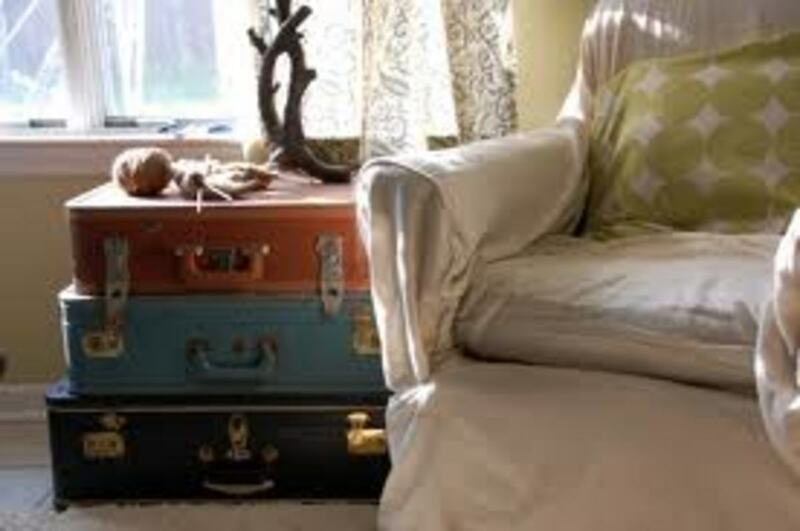 Old mismatched suitcases stacked on end make the perfect end or bedside table. Once the movement took shape it spun off in hundreds of directions. One of which, the idea of re-purposing, taking something old and maybe a little worn and finding a new and better use for it in order to extend it's life has quickly become my favorite! I like it because it carries with it a realm of virtually endless possibilities. Candidly, you can look at almost anything and ask yourself the question "What else could this be used for?" Every day as I involve myself in the day to day activities of re-purposing, I am continually amazed at the creativity that exists inside the minds of some people and the ideas that they come up with that give an item or items new life. Like converting an old set of law books into a light fixture or using wood from an old shipping pallet and old soft drink crates to fashion a cool, artsy looking chair. who'd a thunk it, right? That's what I love about it and what keeps me coming back to it day after day. Every time I see a new idea more creative than the last it just lets me know that with the new day next there will be even more and better ways to put the practice into action. Here's the really good part, people love the idea and even those who aren't necessarily the most creative or simply just don't have or don't want to take the time to do it themselves are still in favor of helping to save the environment and will often pay for an item that has been re-purposed creating the opportunity for cottage industries all over this country. Even professional decorators have gotten in on the game and are regularly recommending re-purposed items or at least a mix of them to their clients. 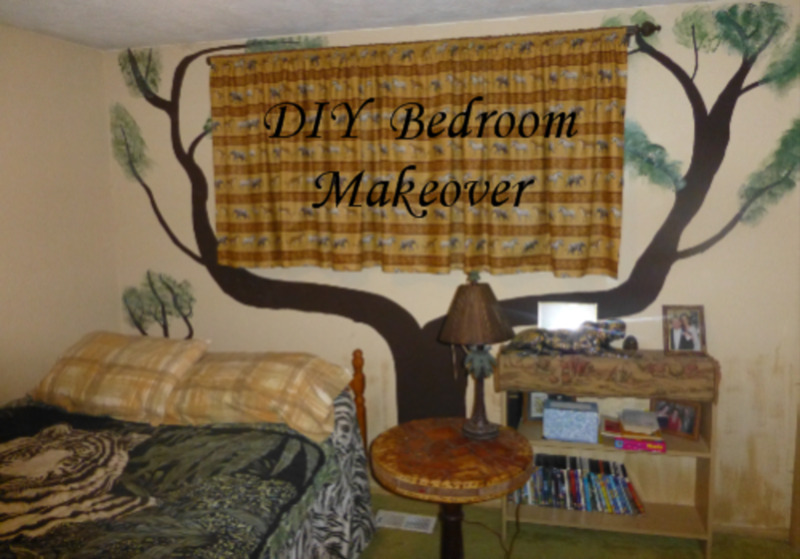 Do you like the idea of re-purposing and do you do it? OK so maybe you are saying to yourself "this is all well and good" but I am just not the creative type. I go to Rooms to Go and let them match it all up for me." That's fine, you don't have to be. I can have times when my creative juices aren't flowing the best in the world either and it is in those times that I look elsewhere for inspiration. What do I do? I go to the internet! 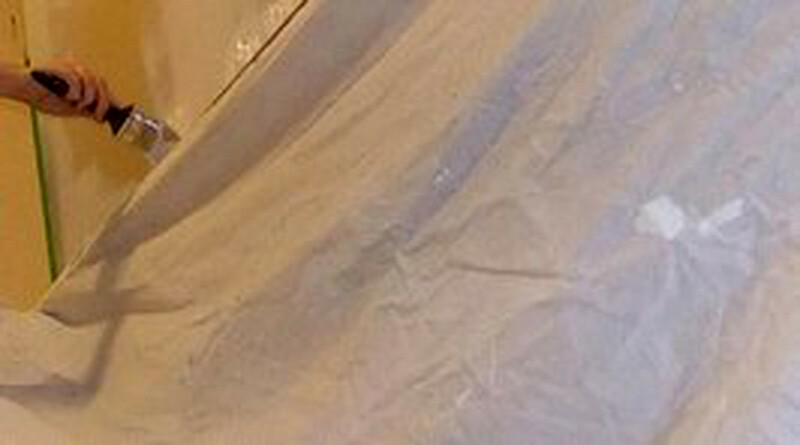 Creative people don't generally have a patent on their DIY household projects. Many of them have blogs, Facebook pages and Pinterest boards where they happily and readily share ideas with others. Let's face it, you can patent taking an old shutter, turning it sideways, adding a top shelf and some side brackets and some heavy metal hook across the bottom to re-purpose it into a cool shabby chic bathroom piece, there are a thousand ways it could be done and yet if you have the necessary items required, can use a hammer and a screwdriver, you can make that shelf if not for you, for someone else and trust me, if you made one you could find someone pretty quickly ready to buy it. So here's the deal, if you like the idea and you think you can do it, give it a try! What have you got to lose? Start looking and thinking about what you could re-purpose and how. The take a stab at it. Put your own spin on it, take a rusty children's red wagon that someone left at the curb, line the bottom with plastic and make it into a planter. 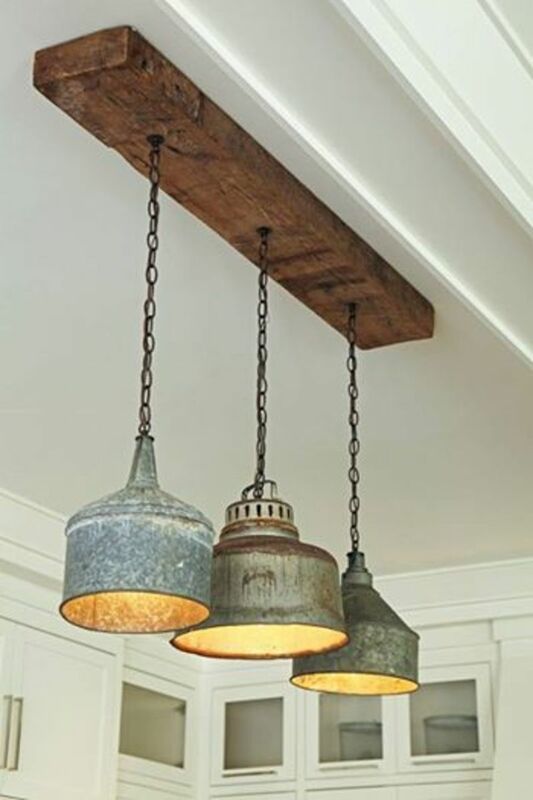 Make a hanging light fixture using assorted clay pots as the globes for your kitchen, use a small section of ladder as a pot rack, or convert and old brass fire extinguisher into an umbrella stand. You can do it, the possibilities are literally without end. When you come up with that idea, that great one that hasn't been done yet. Let me know I would love to hear about it. Who knows you might be that undiscovered talent out there just waiting in the wings and before you know it you might be the next re-purposing guru with your own show on HGTV, teaching us all make a great set of wind chimes from a random collection of spoons! 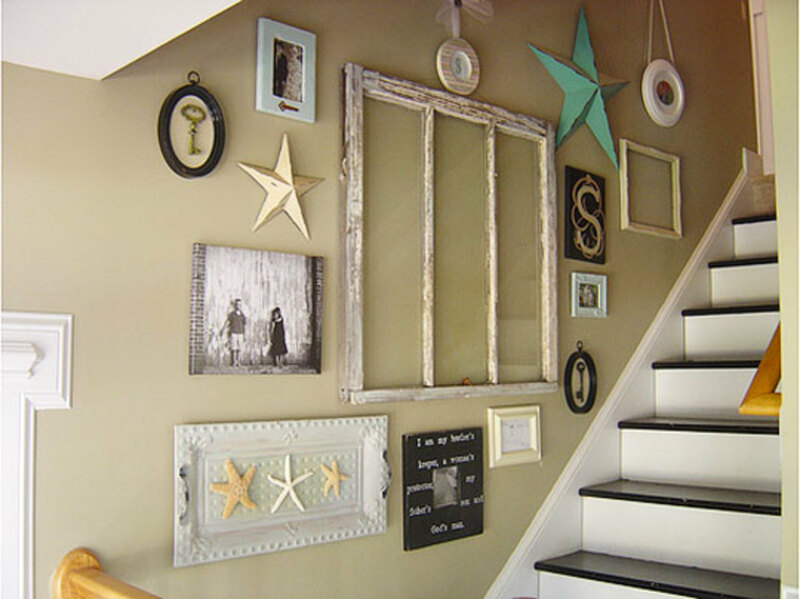 This great collection was done using an old widow as the focal point and ceiling tiles, pictures, collectibles, etc. 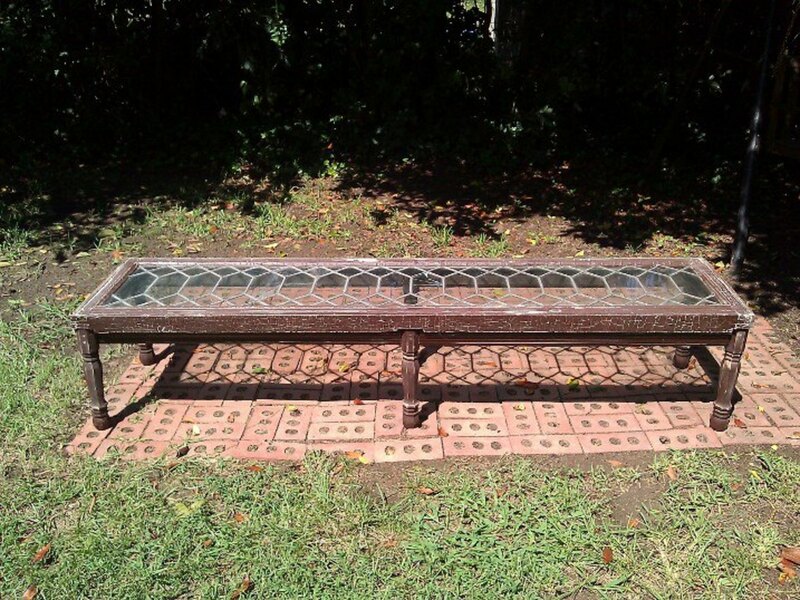 This wonderful long coffee table was made from an old leaded glass window. 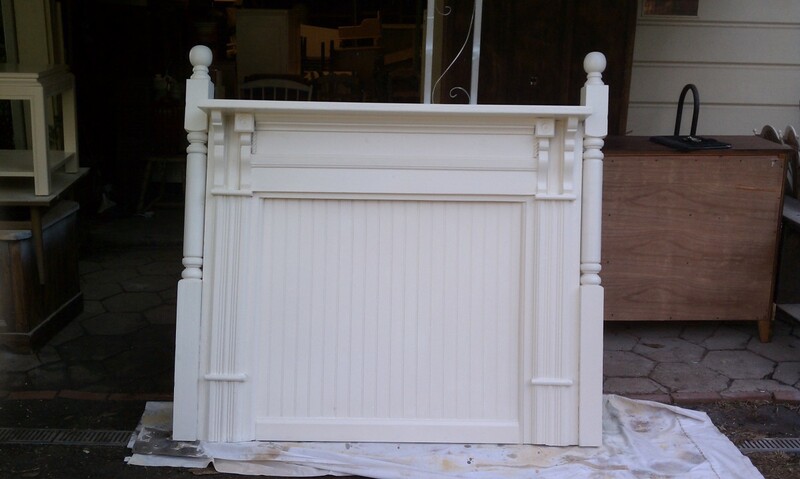 This fabulous headboard was made from an old fireplace mantle! 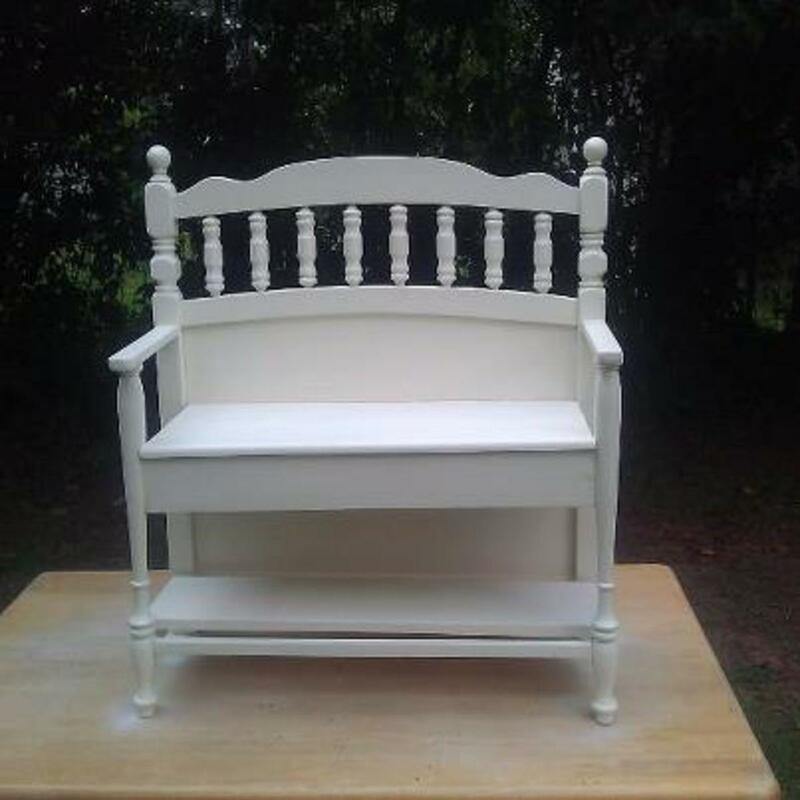 This cute little bench was built using the sections of an old crib! You can do it! Anyone can really. 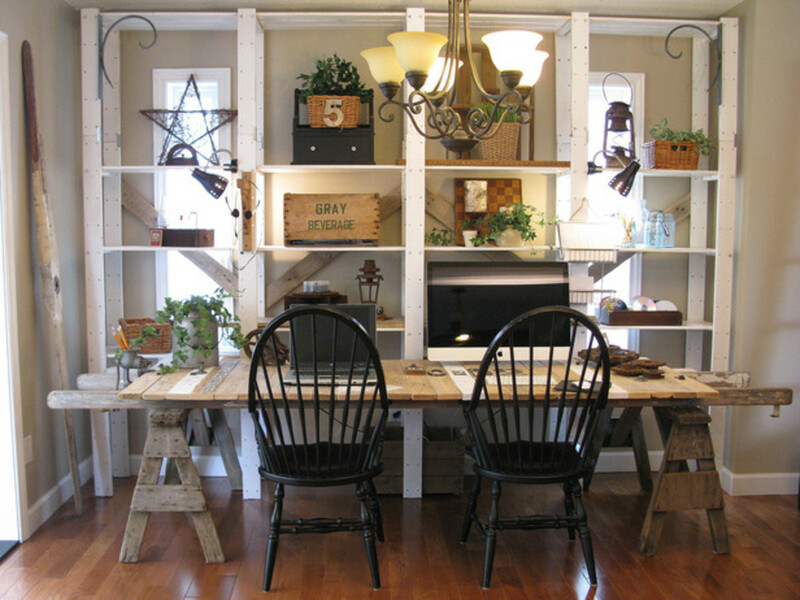 You can use the concept of re-purposing inside or out! Make your garden beautiful and unusual! Re-purpose! You have good examples of what to do about unwanted items. 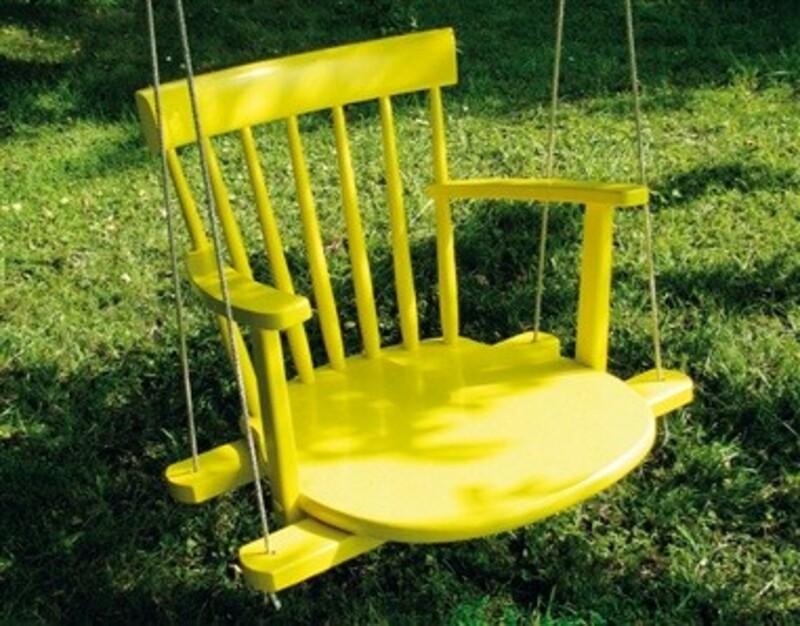 This re- purposing concept is the modern way to recycle and its so creative! 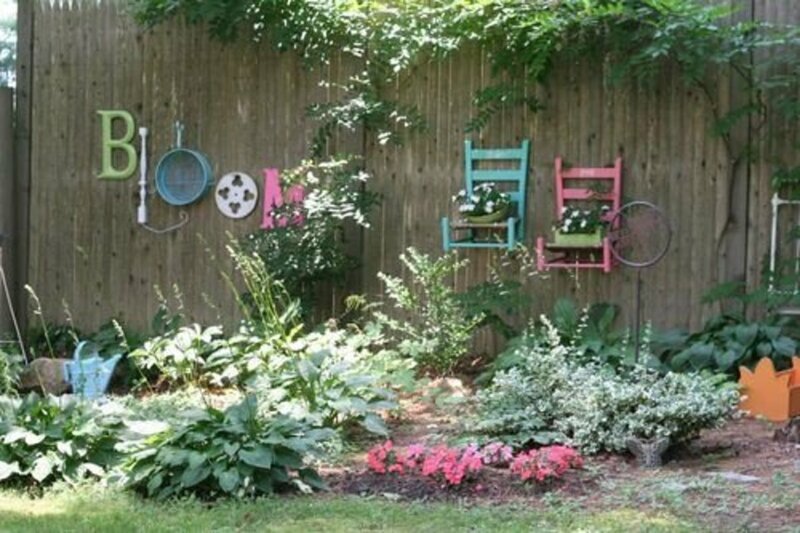 I love the little colorful child's chairs on the fence to hold planters. We are in the process of decorating our home. I love all your ideas! These are great! Up+ and pinning! Thank you for sharing! Good for you Creativenovella! I am glad you liked it! Thanks for the read and for you comments! I love recycling old and making new and useful things for the home. Great post and inspiration for me. 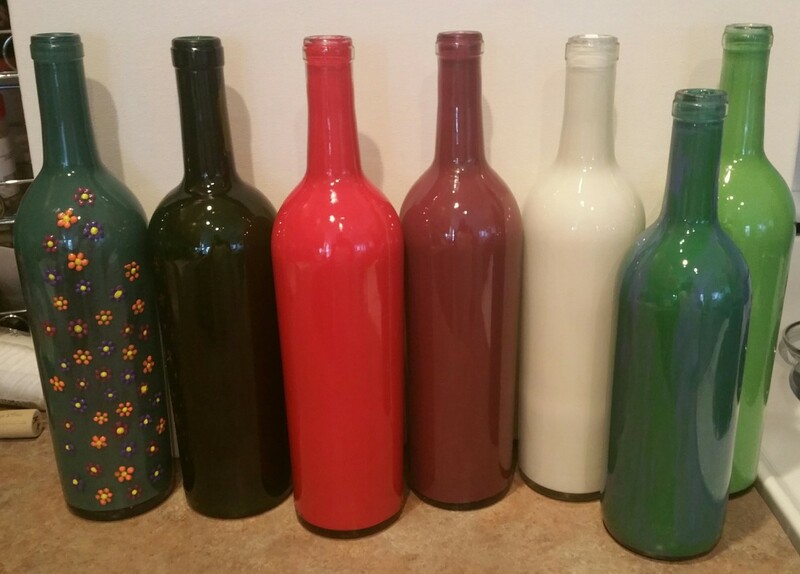 I just bought some glossy bright colored spray paint today to refurbish some thrift store items I found. After seeing this post I'm going to spray some old suitcases too! Thanks WicanSage! It is really amazing what we can do if we just think about it with stuff that is lying around in our attic, basement or garage. I get excited each time I have or see a new and original idea! I appreciate the read and the vote up. Thanks again! wow, what beautiful and awesome ideas here. I've used a ladder as a shelf and have seen some of these types of ideas, but you've definitely collected and hit me with some new inspiration and food for thought about what I can do with the junk closet stuff. Nice work on this hub, voted up!